We arrived early on our first day and decided the first thing we had to do was go exploring in Hanoi's vibrant old quarter. The old quarter lies in a triangular area in the north of the city centre between the 4 red font coloured streets below. What makes the old quarter so interesting is that every street of the 36 specialise in selling something different - Hàng Bạc specialises in silver and jewellery; Hàng Chiếu sells decorations and Hàng Gai is silk street. Every street is tightly packed (so keep your belongings close) but the bustling activity of people, shops and motorcycles zooming in and out made it an adventure getting lost and discovering something new on every corner. Lying on the outskirts of the old quarter we found Cafe Giang - the cafe that specialises in egg coffee. Egg coffee is a creamy concoction made from egg yolk, condensed milk and coffee and Hanoi is the only place in the world you can find it. 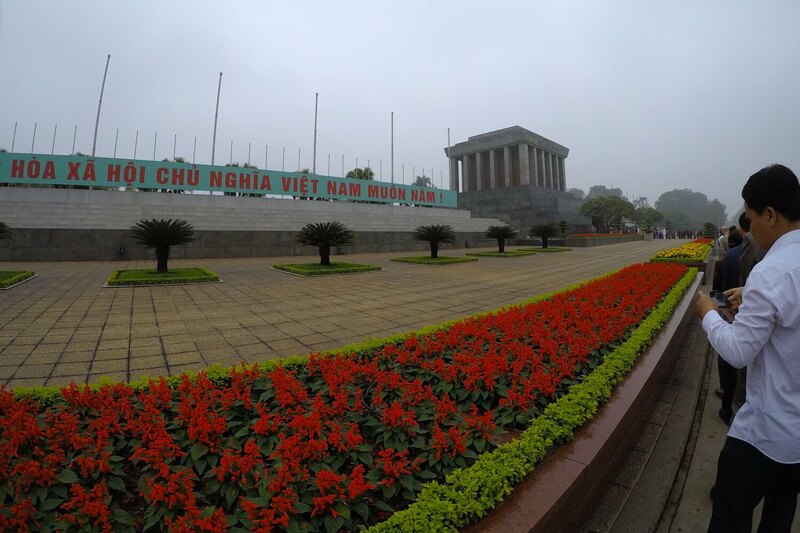 No matter how early you arrive at the Ho Chi Minh Complex you will not beat the crowds at the entrance - we arrived at 8am and there was already hundreds of people in line. It took us about an hour to get in to the Mausoleum and we got 30 seconds to see the body of Uncle Ho which was pretty cool. Cameras are not allowed in the Mausoleum so I got this sneaky snap outside with my go pro. Outside the Mausoleum we spent an extra hour exploring the Complex which included the Presidential Palace, Ho Chi Minh's Stilt House and the One Pillar Pagoda which was built in the 11th century. 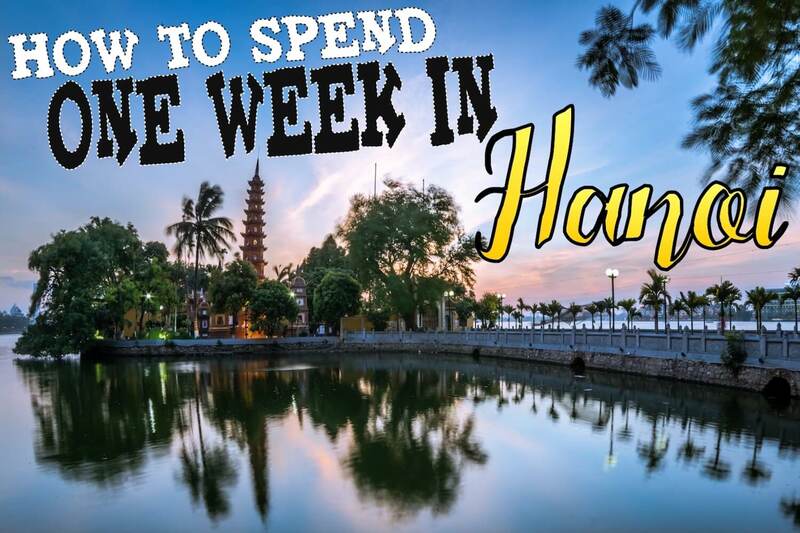 If you're feeling adventurous you can walk to the Tran Quoc Pagoda from the Mausoleum in about 45 minutes. Sitting on the West Lake, it is Hanoi's oldest Buddhist Temple. It's a small complex, but felt like a breath of fresh air with its picturesque views and pleasant tranquility away from the bustling city. 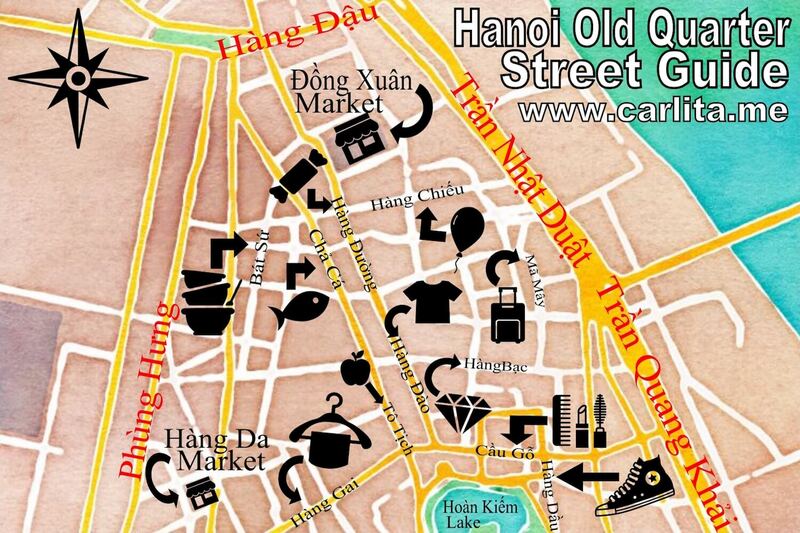 The French Quarter of Hanoi lies south of Hoan Kiem Lake and is home to a number of luxury eateries and shops. We found it easier to navigate this area compared to the tightly packed Old Quarter. Personally I enjoyed wandering in this area more than the Old Quarter but I would save my pennies for the more affordable parts of the city. On the south east corner of Hoan Kiem Lake we stumbled into the Trang Tien Plaza. Divided into 6 floors this is where the rich and famous come to shop. We enjoyed strolling around for an hour but with an abundance of bargain markets just a few streets away we didn't bother buying anything. Right in the centre of the city centre is Hoan Kiem Lake. In the centre of the lake lies two structures - the Turtle Tower which is not accessible to the public and Jade Island. It doesn't take long to walk around the lake - maybe an hour and a half at most - but we found it a relaxing way to enjoy the scenery and take some memorable pictures. The Huc Bridge leads to the Temple of the Jade Mountain which lights up at night and illuminates the entire lake - however you can only visit the temple during the day. Its small and there is a small cost to cross the bridge but definitely worth at least a few minutes of exploration. A 10 minute drive from the city centre we found Hanoi Zoological Gardens. I feel like I'm in two minds about my experience at the zoo. 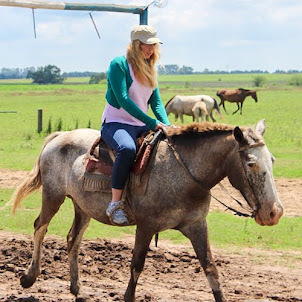 On one hand it is super cheap ($2USD entrance fee) and I got up and close to exotic animals such as tigers and lions which I've never done before. On the other hand some of the exhibits are depressing - the enclosures are tiny and concrete floored with no greenery. It seemed like a cruel exhibition however as Vietnam is a developing country I think this is exactly what I should have expected. Across the road from the zoo is the Lotte Center which encompasses a department store, hotel and observation deck into one 65 storey skyscraper. We spent a few hours in the department store which is high end and full of luxury items. We waited until 5pm to enter the observation deck on the top floor because the tickets are half price at sundown. For $7USD it's a decent price compared to other sky decks worldwide and you don't have to pay extra to enter the suspended window area. After spending a full day walking all we wanted to do was relax. Like Ho Chi Minh City, there are hundreds of spas and massage centres in the city centre, so we decided to treat ourselves to an hour long massage at the Hanoi La Siesta Spa. For $30 an hour how can you not treat yourself just once (I dont know if this is expensive compared to other countries but in Australia it is a total bargain)! A 15 minute taxi ride from the city centre is the Vietnam Museum of Ethnology. This museum really opened my eyes to the ethnic diversity of Vietnam - the Vietnamese aren't one single homogenous group but 54 different ethnic groups each with unique customs and practises. The museum houses artifacts and information about the diverse ethnic groups. I really enjoyed the outside exhibition which has full size replicas of houses and buildings of Vietnam's different minorities which offers a glimpse into their lifestyle. From the museum of ethnology we took a taxi to the Temple of Literature. Not only is this temple a stunning example of Vietnamese architecture, it takes you on a journey back through time - it is Vietnam's first university established almost 1000 years ago. Strolling through the serene grounds we found turtle stelae with faint Chinese characters which are the names of graduating students throughout the centuries. If you're a lover of history this temple is a worthwhile detour outside the city. Okay I have to be honest - the day we tried to visit the aquarium was a bit of a disaster... but we still had an adventure nonetheless. If you want to visit a mega mall in Hanoi you should know there is more than one called the Vincom Mega Mall. Originally we planned to spend our time at the mega mall with the aquarium but when our taxi took us to the Royal City Vincom Mega Mall and there was no aquarium inside we realised there was more than one. Royal City is the largest mall in Hanoi and is underground the huge apartment complex you can see below. If you want to spend a day at a Vietnamese mega mall I recommend Vincom Royal City, it is so big you could spend half a day here. After having a stroll around the Vincom Royal City Mega Mall we went back to the taxi stand and made sure our taxi was taking us to the correct mall - the Vincom Times City Mega Mall. About half the size of the Royal City Mega Mall, we easily found the Vinpearl Aquarium. Compared to other aquariums it is small - but we loved it. You will find the typical fish you see in most aquariums, in addition to marine animals unique to Vietnam. For the adventurous foodies who want something a little more unique than egg coffee, you can find a community in Hanoi that specialises in snake. 20 minutes north of the Old Quarter, our hotel recommended the Nguyen Van Duc Snake restaurant. For one million dong the staff prepared 10 different snake dishes for us made from a single fresh cobra we chose - not a single part of the cobra went to waste! Maybe not for the faint of heart, it was a genuine Vietnamese experience. 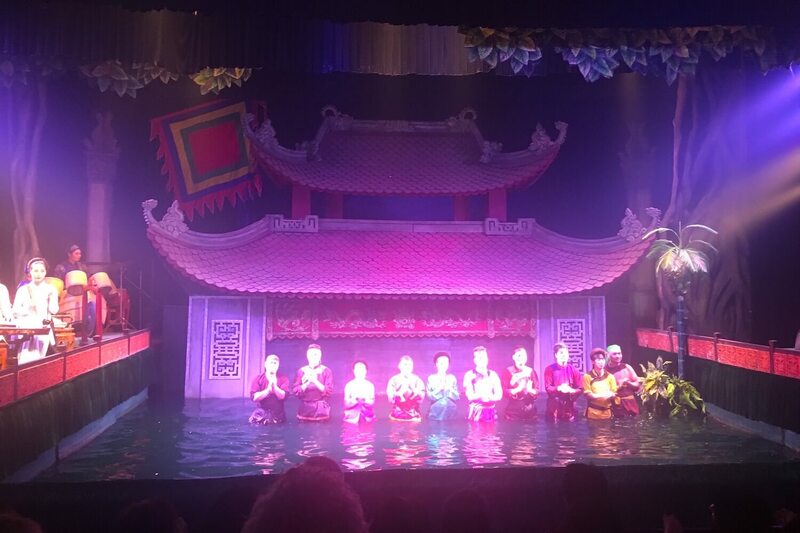 Water Puppetry is another tradition unique to northern Vietnam. We went to the Thang Long Theatre in the Old Quarter which charges $5USD for a 45 minute show. Performed in thigh-high water with singing and instruments as accompaniment, although it's a little tacky we would still do it again. At the end of the show the performers come out behind the stage and you can see how much work goes into the performance. 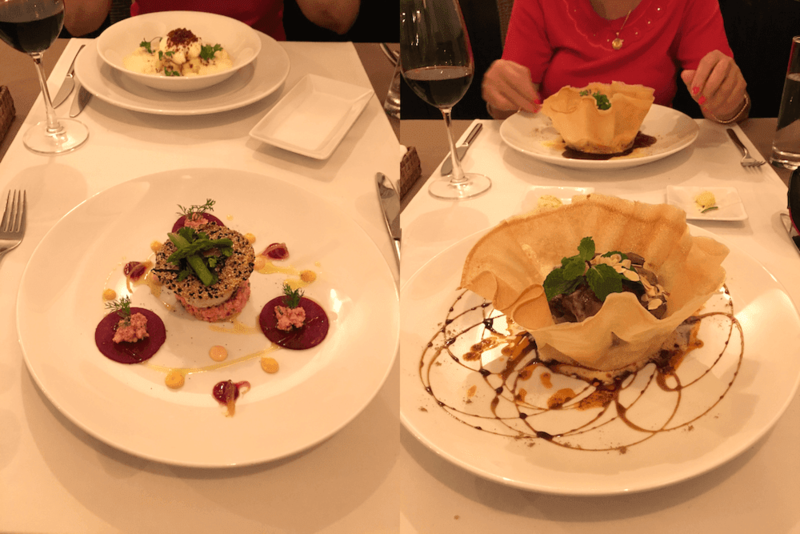 Recommended to us by our hotel La Badiane is a French fine dining restaurant with a Vietnamese flair. Compared to the cost of fine dining in Western countries it was a bargain - and a memorable way to celebrate our last day in Hanoi.